I blogged some time ago about salad offerings of 2 fastfood shops. Amie and Jgotangco gave useful tips on where to get the "raw materials" to make your own. So I decided to check out sections in Landmark at Makati which I do not usually frequent. Lo and behold. Landmark has changed the layout of the grocery section, so I stared at the new map for quite a while before squeezing my way into the toiletries and food section with my wife's list in mind. My buddy and I finally got to the greens section. Oooh! Lots of choices, at only 19.00 each! And there were the largest onions I have ever seen! I guess these are the ones used for onion rings? Plus brightly-colored bell peppers and plump tomatoes abound! There were also ready-made salad with dressing in plastic packaging at 50+ each. A middle-aged couple were looking at these and they remarked to each other it's still best to make the salad yourself. Which stopped us in our tracks because we were about to dump some into our cart. I'll go back this weekend and make salad for lunch next week! 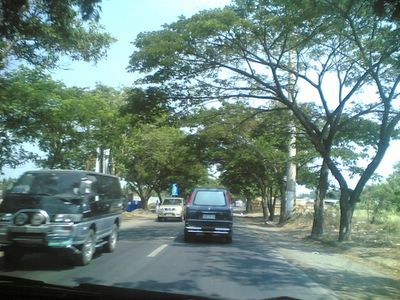 Day 2 of the Road Trip leads us to the southern part of Manila. We only have two destinations, a couple of which were not able to accommodate our number. 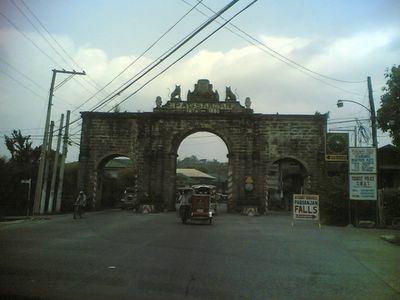 Our first destination is Lake Caliraya located in Pagsanjan, Laguna. That's a three-hour (approx) trip by land from Manila. The lake is actually man-made, and is located atop the mountains. It was my first time to actually visit this place, and it was an eye-popping scene indeed. I didn't realize the lake would be huge! Tilapia thrived in the waters. Chu made an apt desctiption to a couple of places. He said that if White Rock in Subic is a place of revelry, Caliraya is for quiet meditation. I can't help but agree with him. While both places have wide areas to roam about, White Rock looks quite festive. Caliraya, on the other hand, is quiet and serene. And quite rightly so, for it was originally a place for retreats and youth camps. The facilities are more than sufficient for a company outing, though. There's a basketball court, a badminton court, a couple of tennis courts, there's kayaking and jet skiing. The food is priced just right. Our next venue led us right at the opposite end of Laguna and into Cavite. It was around four-hours' trip climbing to another mountain, and into Puerto Azul. The place was nice and quiet. The cottages are elevated, and the flooring is made of lined-up planks. It reminded me of the huts of the Ewoks from Star Wars, actually. The place was in the mountains. Walk a little futher off and you get to the beach. However, we agreed that everybody wouldn't fit in here as well, and the beach grounds look inadequate for our planned activities. Hats-off to the courteous staff at the restaurant for the very nice dinner and for the lady-in-charge who ran after us to return Fisherpau's mobile phone! We were able to get home a bit earlier than the first Road trip, but only for a couple of hours. We're relieved that it's over, and we look forward to doing our report to the team on Monday. Yesterday, Chu the Man, Fisherpau and I went on a road trip with the mission to find the best weekend destination. This is a condensed version of the trip, as we prepare for another one today. The first day takes us to the north of Manila; today, we go south. This is the first time we saw the North Luzon Expressway since its major renovation. The roads are indeed nicely constructed, and the trip across this major road was a breeze. However, we got the fright of our life when we discovered the exorbitant fees they charge! Our trip started at 10AM; we found ourselves wending our way to Bulacan, where 8 Waves by lunchtime. It was a nice place to stay for hanging around swimming pools. Lots of shaded areas for picnicking outside without the summer sun bearing down on you. And they have a wave pool as well! The next part of the trip sent us to Clark Special Economic Zone, one of the former US military bases here which was evacuated at the onset of Mt. Pinatubo's eruption in the early 90s. We visited the Mimosa Golf and Country Club and Fontana. Both has cottages which can comfortably fit 6. While the former's facilities are more accessible by foot (swimming pool, large green field for outdoor activities), the latter has a very nice water park, also with a wave pool. Later that afternoon, we headed off to Subic (another former US Military base) enroute to White Rock Beach Resort and Hotel. This is by far the nicest place we have seen! White Rock is situated near the beach, and the grounds are wide-spaced. There is plenty of room for everyone, with cottages fronting the beach. There are also shaded hammocks for relaxing the day away. Too bad it was already nighttime when we arrived so I wasn't able to take photos with my camera phone. The photos are with my colleagues. The downside is that this is also quite a far-off place. It will take around 4 hours to get here from Manila. 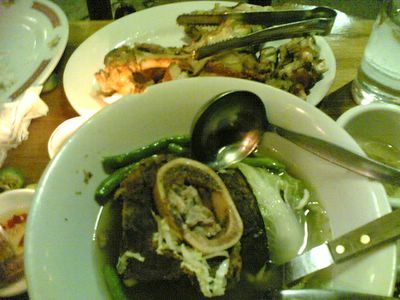 After the long trip, we headed off to Gerry's Grill in Subic and had bulalo, crispy pata, and grilled squid. With a couple of beer for good measure. The road trip lasted around 14 hours, and we made it back to Manila by 12 midnight. I should have worn sandals or more comfortable shoes; my feet are killing me! But many thanks to Chu for driving! That's it for yesterday. Today, we go south! There's this rather obscure story that explains how Tagaytay got its name. A group of foreigners (either the Spanish conquistadores or the U.S. ... take your pick) was travelling in these parts and he did not know where he was. He then chanced upon a father and his son drinking along the roadside. They were quite intoxicated already, so they did not take notice of the strangers approaching them. They then asked the drunken duo, "Where are we?" (translate this in Spanish if you picked the former in the above choices). They did not hear him, but rather the son said "Tagay, 'Tay!" (Cheers, Father! Ole'! Aye Caramba!). The group thought his question was being addressed and hence they christened the place Tagaytay. And what a wonderful place it is indeed to have a couple of drinks. 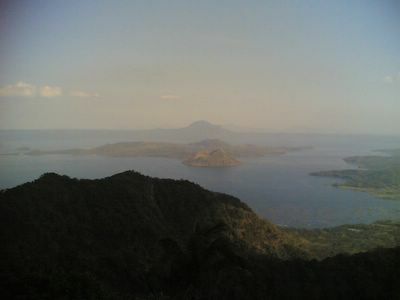 The weather is cool (people who'd like a weekend retreat amongst nature and cool climate would go here rather than make the six-hour trip to Baguio), and you get to see the famous Taal Volcano. It is situated within a lake, and within the dormant (I pray it is) volcano is a small lake. This is the lake-within-a-lake. I was there last Thursday and Friday for a rather rushed assignment (I was notified only last Wednesday) to assist in our presence in a convention there). Then yesterday, our colleague treated us to bulalo (soup-based beef dish), crispy pata (deep fried pork), and a couple of drinks. It was a fitting ending to a rather engaging couple of days. Chu the Man agrees. Tagay! I have a post in blogkadahan.com on the current thread, "Ano gusto ko maging paglaki ko" (what I would like to be when I grow up). Do visit this blog; I shared some things on how I ended up having a career in I.T. Also posted there are the experiences of my fellow blogkadahan members. It's in that blog where I also get to write in Filipino, which is admittedly more difficult than to speak it :-). Thanks and see you there! When I eat out fastfood-style, I usually order a little bit of things when I do not want burgers. And such was my preference one fine Sunday evening with my wife. Apart from Jollibee's Palabok, I decided on having salad on the side. Only when I got to my table did I realize that I've been duped! Sure, the salad costs under 30 pesos, but what's with the sparse arrangement of sorry greens, a couple of tomato slices, and an egg slice? I felt robbed, shortchanged, cheated! And hungry! Compare this with the side salad of Wendy's, also under 30 pesos. Okay, I know it's a bit unrealistic to compare the veggie salad with the macaroni, but I'd say, with two similarly-priced products, I'd go for a more-filling macaroni side salad anytime rather than get a paltry serving of greens for my money. The sauce is on the sour side, though. I just made myself hungry with this post. I'm off to try other budget-priced goodies! There was a time when men were not the only dominating beings in this world. Long before men discovered machines that paved the way to industrialization, there were nymphs and centaurs in the woods, there were mermaids and monsters in the sea, and there were gods ruling the elements. It was an age of wonderment, when men found creative ways to explain why things are as they are; why there are stars, why lightning is cast-off from the skies, how the very universe was created. It was a time when men were close to Mother Nature, and they respected each other. These stories are not lost to us. Pages upon pages of wonderful stories filled with love and war and adventures await as we turn the pages of Mythology. I have loved these stories since grade school, and I am now revisiting these wonderful times in my spare time, and before I call it a night. Some of my favorite stories include the love story between Cupid and Psyche, and of how the Big Bear and Little bear became constellations, the Quest for the Golden Fleece, and of Pegasus and Medusa. What are your favorite mythological stories? Oh wow. I had a really long day, what with the customer seminar that we oversaw today, and I feel that I'm ready to sleep the whole day tomorrow. But lo and behold, along with my snail mails for today, I received a white pagkaging envelope containing a piece of clothing of some kind. There was only my name on it, so it was the last thing I opened. It's an Ask Jeeves shirt, with "I love bloglines" written in front! When news reached me that Ask Jeeves acquired Bloglines, I visited the Ask Jeeves Blog to check on what's up with this RSS Reader company of which I am a subscriber. Then I saw this post that they were giving away shirts for the early respondents to this limited offer. I am halfway across the world, but what the heck. I sent my request and crossed my fingers. I didn't think they'd be sending me one. This is definitely a pleasant surprise. Thanks Jeeves and Bloglines! There are many people out there, I'm sure, who would like to try their hand at cooking, but has found it to be too cumbersome a task, what with the welding of the knives and the requisite hazardous component of using fire! I, likewise, marveled at the ingenuity and creative output that cooking does. And when I was able to boil water without burning it, I felt it my duty to also share my newfound ability to cook. Sure, I only have a few hours on hands-on experience, but hey, I was able to boil eggs after I boiled water. That should amount to something. So I will occasionally feature simple yet delightful recipes from time to time in this blog. I have another one coming up after this (that of scrambled eggs), but that's another blog. For today, we will discuss how to make meatballs. Meatballs are excellent things. 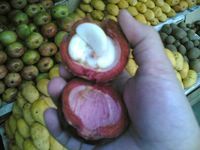 You can eat them as they are (with your favorite dip), or put it in spaghetti, or in soup-based dishes. And it's simple to make. Yummy! Grate the onion. Shed tears if you must. But it's not part of the ingredients. Mix the carrot, onions, and celery with the ground beef. canola oil in the frying pan over low-to-medium heat. Drop the meatballs into the pan. It's great if the meatballs get submerged in the hot oil. Pierce the meatballs so the inside gets cooked as well. When the meatballs turn brown (I like it dark brown), it's time to get it off the oil. Grab a plateful of rice and enjoy! Firstly, I admit that I'm not really the regular church-going type. So it's a good thing that my wife is. She invites me to hear mass on Sundays and I obligingly attend with her. And for the times when I hear mass, I do listen to the sermon and participate as much as I can in the activities involved. I miss the songs I grew up with when I was a kid, though. It seems they're churning up new songs every now and then, and I can't quite keep up with the new ones. At any rate, Sunday mass is also a nice respite from staying at home in the weekends. Because after mass, we'd mill around the ground in front of the church and buy goodies street vendors have for the day. And if you go to mass early in the morning, you likewise find nice goodies. 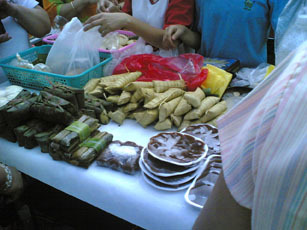 The rice cakes are very popular, and disappear rather quickly. 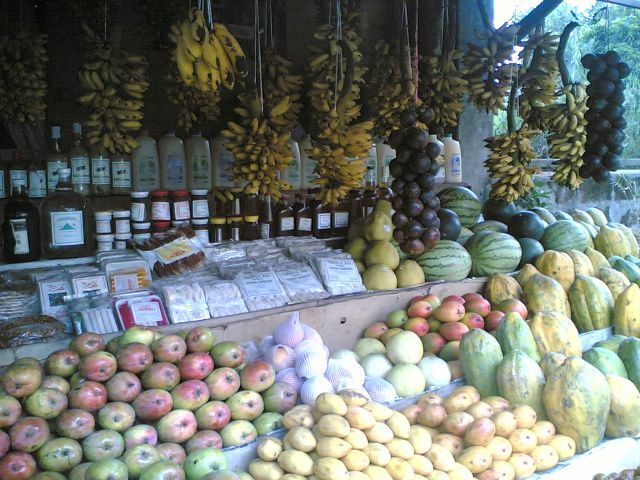 Fruits also abound. 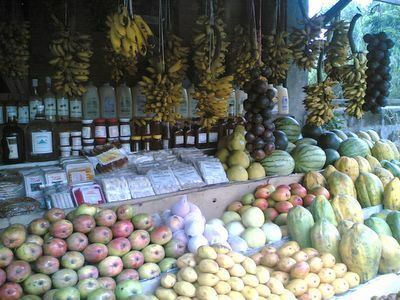 Mangoes, watermelon, bananas, and lots more. You may also find your lunch meal here. A vendor sells fish cooked in coconut milk (sumptious! ), or embotido (yummy! ), or buy vegetables to cook later (I love veggies!). It's a nice way to start the morning: commune with the Lord, and then treat yourself to great food!